Welcome to Titusville Outdoors Fish Gallery! Tired of telling your friends about the "Huge" fish you caught, only to have them give you that look? You know the Look. The one your high school teacher gave you when you told her Aliens abducted you and stole your term paper on Geothermal Physics? The one your dad gave you when the unknown car ran into his new Lexus in the parking lot of the the library while you were doing the research for the same paper? Even though it looks more like you clipped a tree at high speed because of the bark still embedded in the fender? Yep! You know the look! Well here's your chance to show the world that you are not lying!!! That you CAN catch a big fish! You can send me a digital or a scanned snapshot of you and your catch by using the email link at the bottom of this page. Include your name (makes it easier to caption the photo) and the weight of the fish, (no guessing, guesses are usually wrong on the plus side for some reason). If you have a photo but no scanning capabilities, Send me an email and we'll make arrangements to get it online. 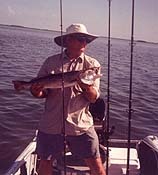 You can send photos of any fish caught in the Titusville or North Brevard County area, whether you caught it in the lagoon, surf, offshore, or freshwater. Questions? Comments? Big Fish? Send em! : Dean Richard Pettit. Plenty of room here for more fish! 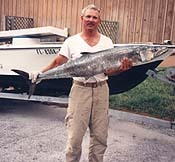 You can send photos of any fish caught in the Titusville or North Brevard County area, whether you caught it in the lagoon, surf, offshore, or freshwater. Back to the FISHING page. Back to the Titusville Outdoors.